What are the dimensions of a cabin? 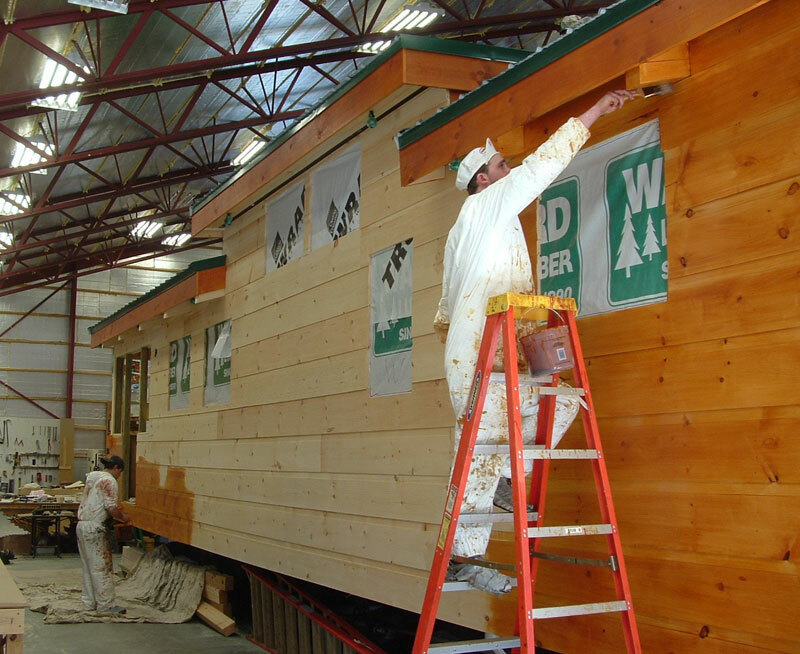 Standard cabins have exterior measurments of 12' x 33' 4" for the living space (399 sqft.). 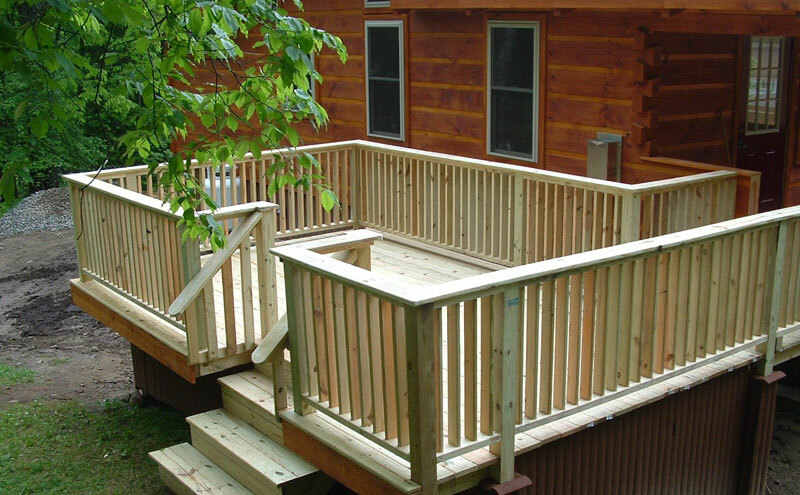 Attached porches add an 12' x 8' area (96 sqft.).  Total length measures 41' 4" (add an additional 3' when tongue is attached). Maximum Tow height measures 13' 11" Weight is approximately 19,000 lbs. with a tongue weight of 3,500 lbs. Widest point is 14' at the roof eaves. Can the cabin be used during the winter? Yes, based upon what insulation package you request. 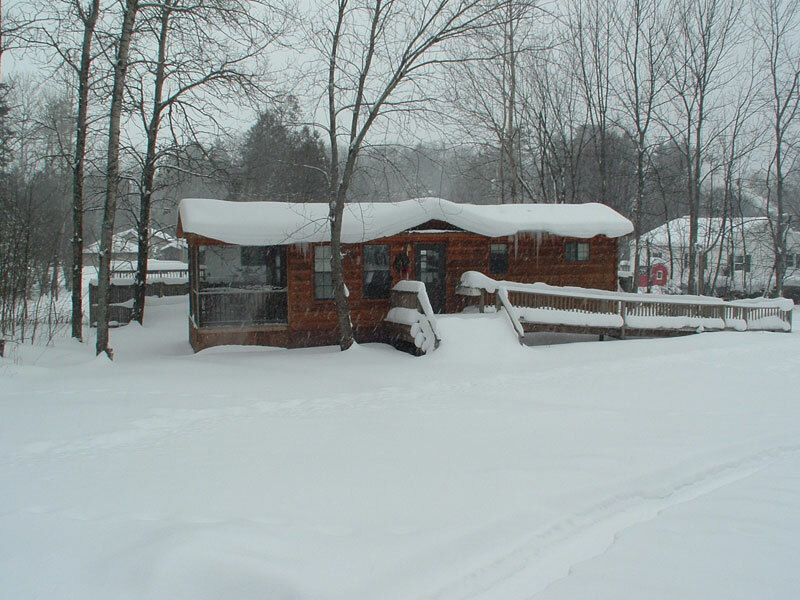 Our cabins can be built for the deep hard cold winter nights of Saranac Lake, New York where it can drop to -39° F. High quality PEX waterlines are used to prevent damage from freezing and cold temperatures. How to I get my cabin moved to my property or site? Our cabin trailers are not licensed or registered by DOT for road use, although they are issued a VIN (Vehicle Identification Number). 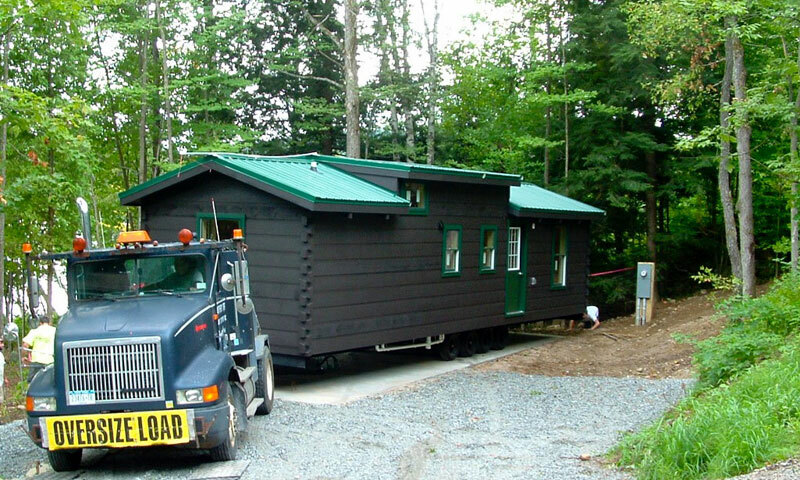 The overall size of the cabins requires special state permits to transport them on highways within each state. Professional trucking firms are contracted by owners, with the help of our company, to arrange for delivery. Can I move my cabin to another location in the future? Yes, your cabin comes fully equipped with four axles and a removable tow tongue to allow you to have your cabin professionally moved at any time in the future. Axles and tires are built to remain on the Park Model Cabin. Does the wooden exterior require constant maintenance? Unique to the RV industry, our cabins offer full 12 inch roof overhangs to direct rain and snow away from the siding and foundation. Double coats of SIKKENS exterior stain are applied under ideal conditions to ensure longevity and will provide years of maintenance free use. What features are required at my site prior to the cabin arrival? 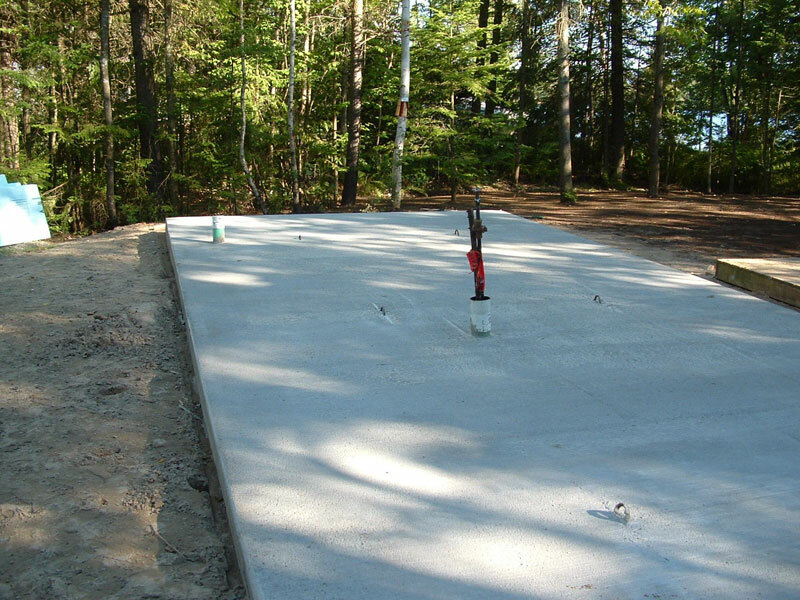 For long term applications we recommend a “floating" concrete pad which needs to be 1 foot wider and 1 foot longer than the dimensions of the cabin. Like any other residential home project, prior to pouring the pad, all utilities need to be brought to the site (water, sewer and electric) and should be located under the middle of the pad for ease of connections once the cabin arrives. How much does a cabin cost? 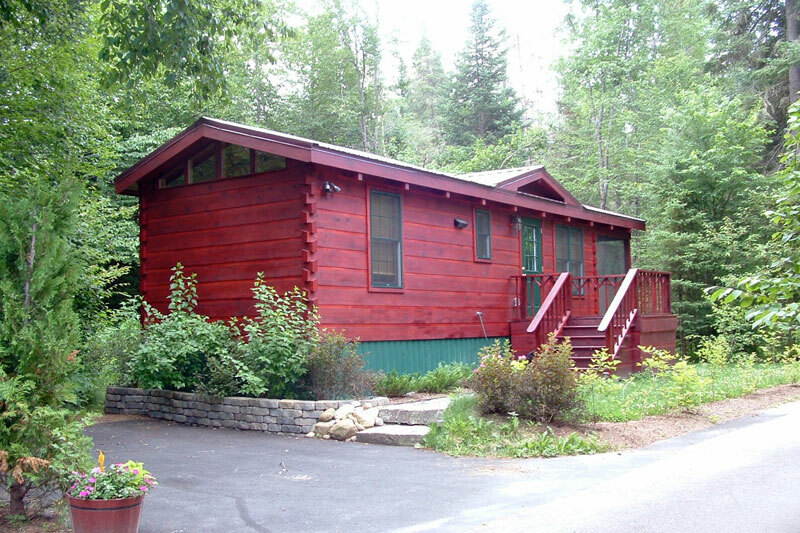 Due to the custom nature of our cabins the pricing varies widely. A seasonal use, simple small cabin can start in low $30,000 range while full size cabins with basic features can range from mid- $50,000 - upper $60,000 and deluxe fully loaded and super insulated cabins can range from low $70,000 - mid $80,000. So size and features will drive the price which is why we offer free cost estimates once we know what level of cabin home you seek.